Shop Locally with our Free Real Estate Applications! 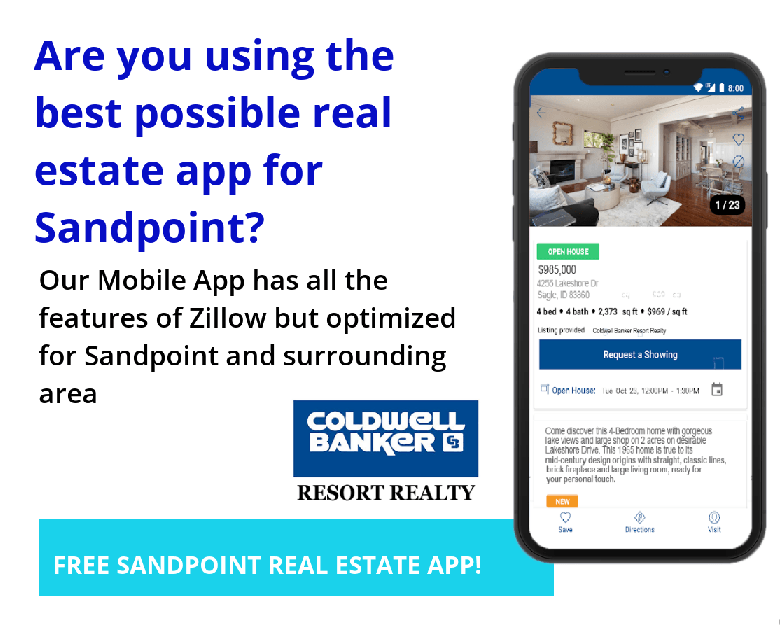 Next time you search for Sandpoint Idaho Zillow, give our Sandpoint Real Estate Apps a try. They have all the same features but optimized for our area! Walking through downtown Sandpoint, all the real estate offices that used to be full of people looking for homes for sale now appear mostly empty. Let's face it, technology has completely changed how we all shop for homes. Thanks to sites like Zillow, Realtor.com and the dozens of others like them, we can window shop listings, save the homes we like and narrow the search on our own without ever calling an agent. We live in the future people, why should we have to put on pants to buy a house? "all of the brokerage websites and other web syndications combined only account for about 8% of the views. Clearly, Zillow built the better mousetrap." It isn't just the role of the real estate office that is changing. According to our metrics, in the last 30 days, our office's listings were viewed a total of 3,473 times on various platforms such as coldwellbanker.com, century21.com, homes.com, zillow.com, Wall Street Journal and a bunch more but you get the idea. Of the 3,473 views, 3,206 of them were viewed on Zillow. That means that all of the brokerage websites and other web syndications combined only account for about 8% of the views. Clearly, Zillow built the better mousetrap. "The odd part of this whole thing is that in Sandpoint, Idaho, Zillow can't show you all the homes for sale." The odd part of this whole thing is that in Sandpoint, Idaho, Zillow can't show you all the homes for sale. Since Zillow isn't a licensed real estate company, they don't have direct access to local MLS data. As a result, many of the listings that are displayed, are no longer available and some of the available properties just aren't displayed at all. Either way, the listing info just isn't that accurate, but this doesn't seem to be a problem for most users. real estate apps offer insights into the market and help arm regular people with information they need to score a home, with or without pants on. Buying a home is probably the largest purchase most of us will ever make. 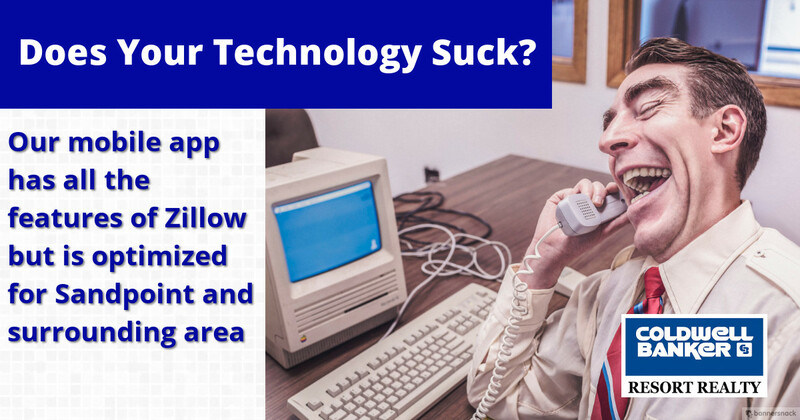 Spending six figures or more on a single transaction is a pretty big deal for most of us and real estate apps offer insights into the market and help arm regular people with information they need to buy a home, with or without pants on. Facebook, Twitter and email integration as well as a "save-to-favorites" function. Highly accurate local Selkirk MLS listings in addition to a database of 1.5 million U.S. and international homes, plus the ability to notify a local Coldwell Banker agent directly about their interest in a property. Search within a geographic area for home search by drawing a shape in the app’s map view on their mobile devices’ touch screens and then see the homes for sale pop up within that area, a feature made popular by Zillow. 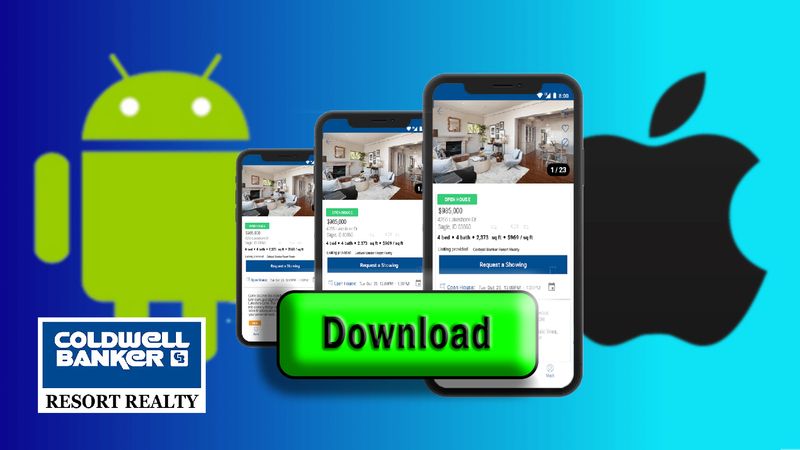 use your mobile devices’ geolocation ability to search for homes and open houses, and get driving directions using the app and access video content from Coldwell Banker Real Estate’s video library. Set up listing alerts when new properties come on the market. After you’ve identified a few top contenders, you can scout out the surrounding areas for restaurants, grocery stores, and shopping centers, or draw your own search area using the app’s traffic feature. When you’re ready to buy, one tap connects you to a Coldwell Banker agent who’ll walk you through the process.